I still consider myself a newbie at styling winter fashion but when I saw Hilary Rushford’s #StyleMeFeb challenge, I knew I had to plow in. Speaking of style challenges, these Sorel Glacy Explorer boots were a style challenge on their own for me (I found them on clearance at Sports Authority last week) . They’re navy, purple, and neon green which is quite a difference from my normally neutral shoe style. My additional #StyleMeFeb challenge was that today’s theme is Animal Print & Fur–I went with fur. I never would’ve paired all these things otherwise and I LOVE how this outfit came together. I almost didn’t wear the necklace because I feared it would be too much with all the bright colors and lips but it fit right in and completed my look. Hope all you gals are staying warm! 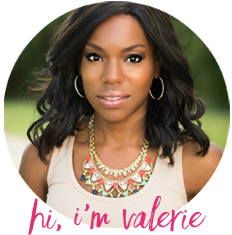 Let me know if you decide to join the style challenge so I can stalk you! Also check out What I Wore Wednesday for more fashion inspiration. The color of that sweater is absolutely stunning with your skin tone. I’m loving that vest, too! I wish you’d send a little bit of that snow to NC because I’m a teacher and I need a snow day!! 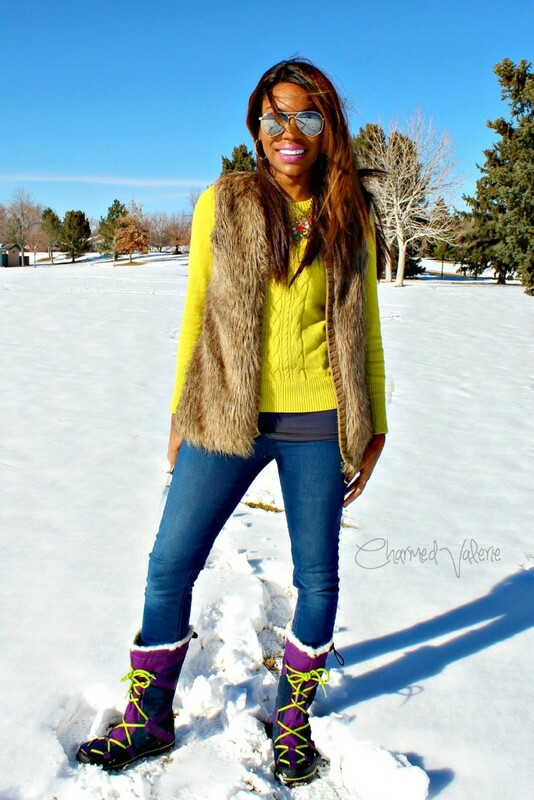 I love the bright sweater paired with the fur vest, especially against the snowy background. Cute! 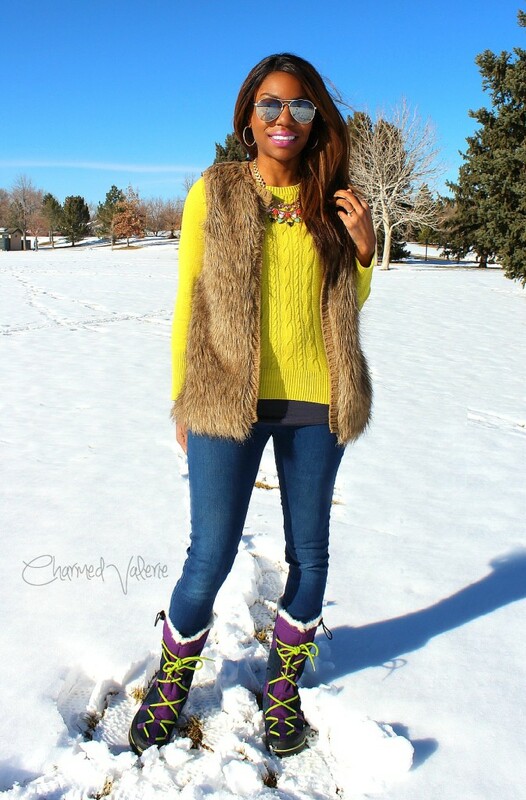 I love the bright colors of this outfit and the boots goes with this perfectly.